Regardless of how I define my "look", these shoes are amazing (no ifs, ands, or buts about it ladies)! I love those gold loafers!! So pretty! Loooove the loafers, they are fabulous!! The first picture is just awesome. LOVE your super cute scarf. 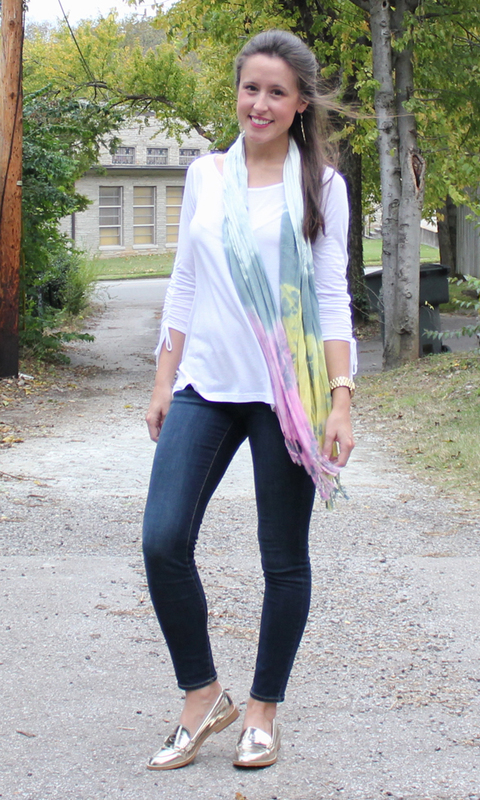 LOVE that scarf! I love the hippie look and wish I could pull it off more! How adorable is that first picture?! Reminds me of a Kate Spade ad :) Love the metallic shoes! Love that scarf!!! :) and those shoes are amazing! I don't know! I think maybe a mix of classic and age-appropriate trends (which isn't very catchy sounding). Love your loafers! Those loafers rock!! I'd say I'm also pretty preppy and classic, but with a touch of feminine (bows, ruffles, etc.). 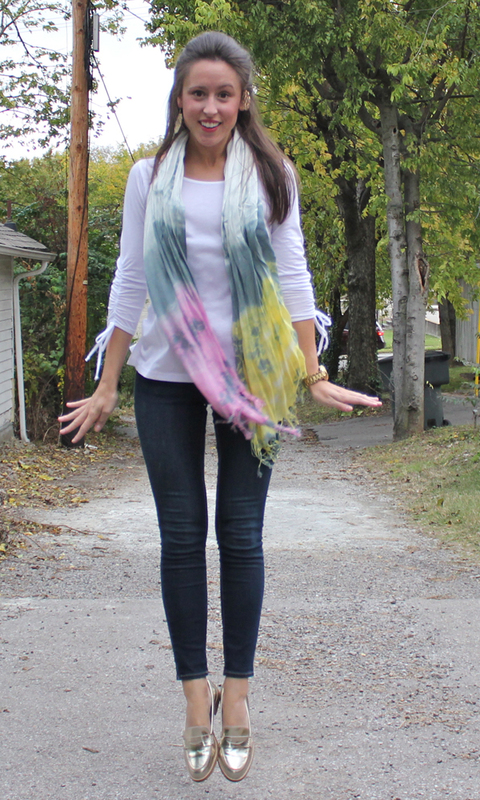 Those loafers are adorable and I love them mixed with the tie-dyed scarf. The jumping photo is soo cute. 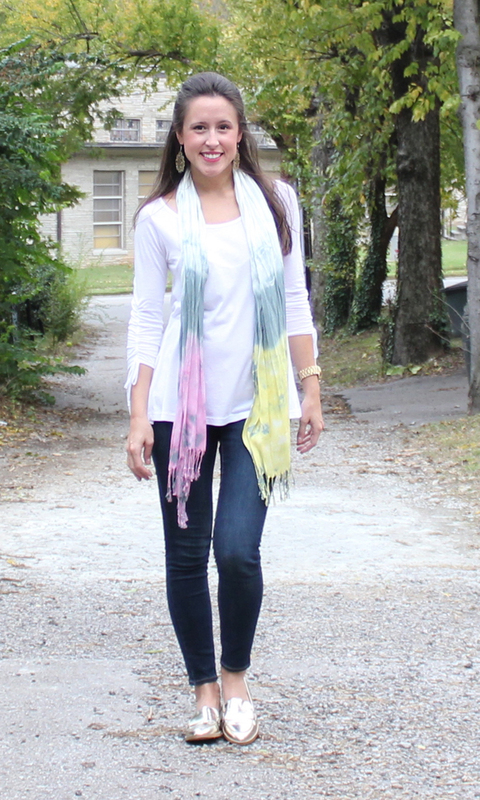 I love the scarf and flats! I would say a little bit of edge. I like to add a bit of an edgy or more 'masculine' piece to my wardrobe. Sometimes I go all-out feminine, but I feel most comfortable in a leather jacket, or moto boots or even a men's button-down. This outfit is simple and I LOVE it! Just LOVE it!!! I adore these shoes! SO SO cute! Lol, that jumping picture is so fun! Your scarf is so pretty. Love the gold loafers! I need those loafers!! They are so pretty!! hahah i like to think my style is kinda preppy and wahtnot but then i throw in random stuff all the time! i don't know about hippie for me but i think you look adorable!